The chairs come completely assembled, only have to remove the wrapping . Really love the look, comfort is fine. No issues whatsoever, I think these are a good value for the price. 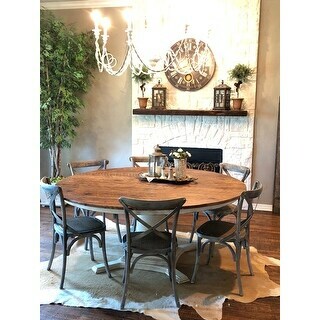 Accent your farmhouse style with this dining chair from The Gray Barn. Featuring an X-back design and a natural rattan seat, this chair is a down-to-earth design that compliments a myriad of styles. 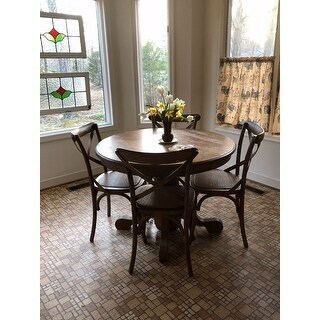 I have an antique drop-leaf table and needed 16 inch wide seats to fit under the ends of the table. This is what I searched for and these came up. In the description it says the seat is 16 inches wide. They are not 16 inches wide and will not fit under my table. 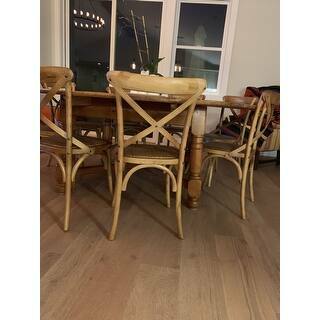 Because the chairs are very sturdy and the color, walnut, matches my table perfectly and it would be quite a task to send them back I have kept them. I just wish the measurement was correct. 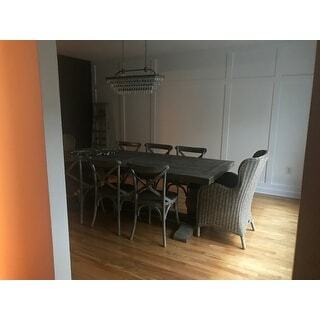 We took a huge risk with these chairs, as we had already purchased our dining table, and I knew that the colors on the website, and the actual color can be different based on the lighting. Returning four chairs were going to be hard too (who wants to worry about carefully repackaging four chairs to ship back), so I knew that if we purchased it, we were stuck with it. 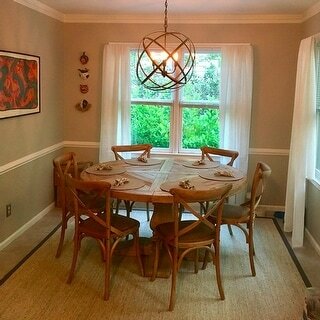 Our dining table was a real neutral wood with no orange, yellow or brown undertone. The best way to describe it would be grey. So, we went with the grey chairs as well. We took the gamble and well, I was pleasantly surprised at how well they went together. You couldn't tell these were purchased separately from different retailers. Plus, it's got that rustic charm I was going for. What a great buy in the end ! I bought these chairs in "natural" and the color is beautiful in person. Amazing quality, especially for the price. I love these chairs. One arrived with significant damage but Overstock sent a replacement immediately. I ordered the gray. They have a slight olive tone which I like. My other favorite feature is that these chairs have a higher seat at 18" than some of the other similar chairs. Our table is custom made, and even though it's beautiful, the legs are too high for most chairs. These help sit us up a bit more. I may still add chair pads to sit higher like we have hidden in the parson chairs. The chair is well made and sturdy. It is also comfortable and very comparable to the chairs found on popular/spendy websites. The gray option is tricky because it isn't well pictured on the site. I would say it is a medium to dark barn wood gray with a tinge of army green in it. It has a heavy white distressing. The distressing isn't paint, it is more of a plaster material. The plaster is thick at the hardware & corners but was easy to scrape off. It was also easy to take off the heavy distressing with a sponge. This piece is definitely heavily distressed, which may not work for all decors, so good to keep in mind. The chairs do have a strong odor at first but it did go away within a few days. I purchased this chair in the "natural" finish which is a light oak with gray and golden tones. The chair isn't at all flimsy and is well constructed with nice hardware. The seat is firm and supportive without being too hard or uncomfortable. I've had 2 lumbar surgeries so I'm very particular about my seating arrangements. I couldn't rate the chair a straight up "5" because there were 2 flaws worth mentioning both aesthetic and don't appear to interfere with functionality of the piece. There was a place on the leg where the wood was split on the surface and reglued. I inspected closely and determined that 1- it wasn't visible and 2- the leg was solid. The second flaw was on the top front ladder of the chair where it looks like a chip occurred and was skillfully overfinished. Clearly the chair was a second but with a coupon the price was just too good and the chair too perfect for the small space (fits nearly flush against the desk when pushed in) for me to feel that it should go back. Overall I'm pleased with purchase! These chairs are very popular and hard to come by!!! They disappear on every website almost as soon as they are in stock. They were exactly what I wanted and I got them at an excellent price too!! Very sturdy!! They didn't have the actual color that I wanted so I ordered the lightest ones (natural) and we lightly sanded them a bit and then stained them to the color that I wanted which was a chocolate brown. They look amazing!!! Great value and made well for a lighter weight chair. Love them!! I order these to keep in stock for projects as they fit a wide variety of design aesthetic. They ship easily and have never had damage. Very sturdy and are comfortable seating. When I ordered the chair I really didn't know what to expect. It looked great in the picture but you never know. When it arrived earlier than scheduled, it was packaged well but still had small scrapes on various edges ( I've never received any piece of furniture that didn't have marks on it from shipping). I used a sharpie for furniture to hide the scratches and it worked great. 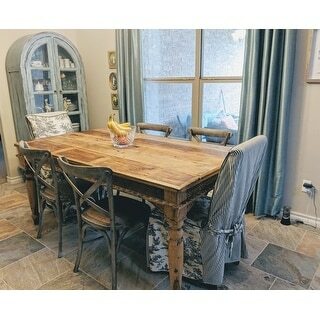 The chairs are well constructed, look beautiful and match my antique table beautifully. The seat has a kind of rattan covering, but it's just a covering over a padded, well supported seat. The chairs are lightweight, but really sturdy. I would highly recommend these chairs. Beautiful chairs. I purchased four in walnut. Excellent quality, comfortable to sit in. Arrived quickly! I’m happy I purchased them. Packaging was not overwhelming/wasteful. Comparable to RestoHardware. Natural was great with our Oak Tabora. Perfect addition to our new dining room! Chairs are nice quality and exactly the color I was hoping for. I ordered 6 and 1 did come damaged but we were immediately sent a new one. Would definitely recommend! Love them! Packing had a funky smell but it faded quickly. Really sturdy for their size and build. We bought 4 of these chairs. They look great with our kitchen table. They do have a few spots on them that aren’t perfect however a deal for the money. May have to purchase a couple more to have for when we expand our table for guest. This chair is light but very well made. I’m using it as a desk chair, and it gets a lot of use. This chair looks high end. It does have a chemical smell to it, but let it air outside for a day and it should be fine. Love the look of it! 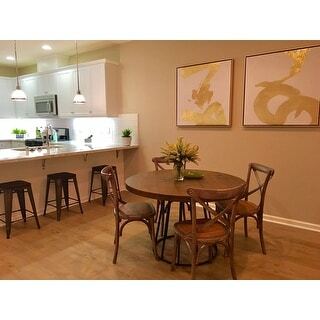 Love the chairs, perfect for our home. Comfortable, stylish. love these!!! very sturdy and well made and a great price. 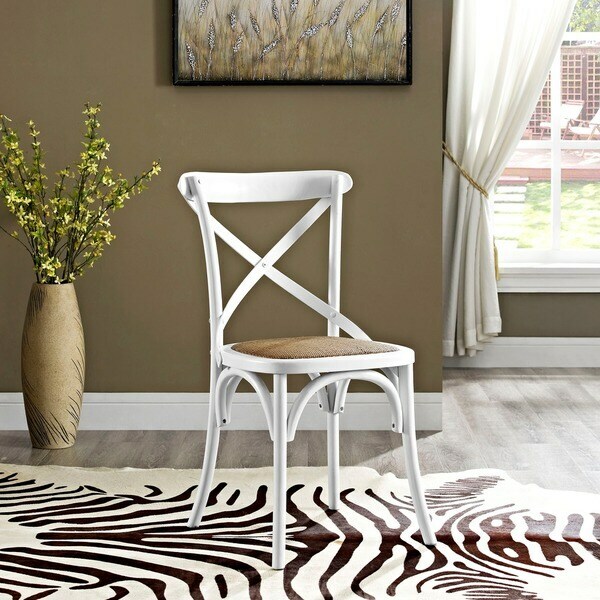 I purchased 6 of these chairs to pair with an antique farmhouse table. They are solid, comfortable at a fabulous price! Excellent for your French country style kitchen. Love them, just as pictured. True white, would prefer if the seat was a little darker. Concerned about how long the seats will hold up, will update review if needed. Matches the desk perfectly..beautiful chair! Absolutely love these chairs. 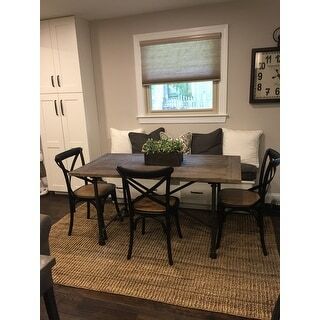 So stylish with our farmstyle table. They came fully assembled so just popped them out of box and around the table. Excellent purchase! "Will White be back in stock soon?" This weighs approximately 11 lbs. "Is the black in a matte or gloss finish?" It has a slightly shiny finish. "I see the width stated as 21", but seat width as 16". 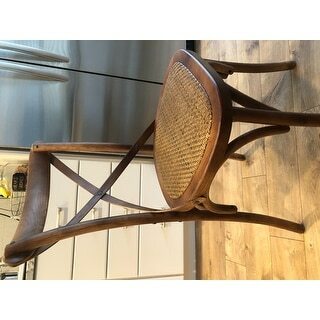 What part of the chair measures 21"? Want to be sure they'll fit under my table." No,these do not come assembled. "What is everyone using for cushions on these chairs?" Haven't felt a need for cushion with the wicker seat. "Is the white color available?" No,the white option is not available at this time.